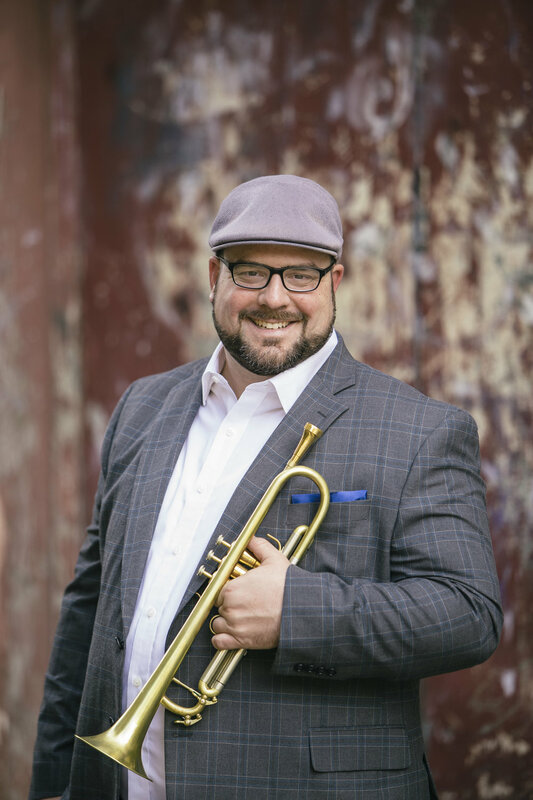 Sacramento-based Trumpeter, Educator, and Composer Joe Mazzaferro is active in the Northern California jazz scene and in demand as a guest artist and clinician across the United States. In November 2017, Mazzaferro released his debut album In Terms Of… (Joe Mazz Music) which features saxophonist Jeff Clayton along with special guests, drummer Carl Allen and pianist Donald Brown. The album peaked at #43 on the JazzWeek Charts and received high praise from jazz critics. The album has been described as “vintage hard bop with maturity” (George Harris, Jazz Weekly) as well “a little bebop, a little swing, and a lot of tenderness, heart, and passion come together on this intriguing debut” (Tom Henry, Toledo Blade). His formal studies include a Bachelor's of Music in Music Education from the University of the Pacific and a Master’s of Music in Jazz and Studio Music from the University of Tennessee, Knoxville where he served as a Graduate Teaching Assistant for the jazz program and arranged regularly for the UT Jazz Ensemble. While at the University of Tennessee, Joe studied improvisation and composition with former Art Blakey & The Jazz Messengers pianist Donald Brown, Mark Boling, and Vance Thompson. After holding numerous adjunct positions at various academic institutions, Joe became the Coordinator of Jazz Studies at California State University Stanislaus in 2012 where he teaches various jazz courses and directs the CSU Stanislaus Jazz Ensemble. Mazzaferro also regularly teaches at Cazadero Music Camp and the Brubeck Institute’s Summer Jazz Colony, is a board member of the California Alliance for Jazz, and a member of the Capital Jazz Project (Sacramento). As an active freelance performer and collaborator, Joe has had the opportunity to ­­perform with many jazz greats, including Dave Brubeck, Christian McBride, Stefon Harris, Eddie Gomez, Donny McCaslin, Donald Brown, Wycliffe Gordon, Jeff Clayton, Ingrid Jensen, Lewis Nash, Montez Coleman, and Jim Snidero. In recent performance opportunities, Joe has had the privilege of performing the Miles Davis masterpiece Birth of the Cool with Gunther Schuller at the 2013 Brubeck Festival and was a part of the series “Remembering James Williams & Mulgrew Miller” with pianist Donald Brown’s Quartet at the 58th Annual Monterey Jazz Festival. Joe also performs regularly at Take 5 Jazz Club in Stockton and currently serves as the Musical Director and Co-Founder of the Sacramento Jazz Orchestra. Mazzaferro has gained critical acclaim as a composer and has arranged compositions for big band for SF Jazz Collective Pianist Edward Simon (Infinite One and Young & Playful) and NYC drummer Carl Allen (My Brotha and The Sacrifice) exclusively for their guest artist appearances. In addition, Mazzaferro’s research interests include topics such as examining the relationship between jazz and popular music styles as well as building communities through the arts. While at the University of Tennessee, he conducted an ethnographical research project on jazz-fusion and crossover music with fieldwork and study that focused on musicians in the Knoxville area who perform in various musical styles including jazz, bluegrass, Americana, rhythm & blues, and gospel. Mazzaferro has also led various community-based projects that include hosting weekly jam sessions in Sacramento, educational outreach through the Sacramento Jazz Orchestra, and developing a jazz series at the Carnegie Arts Center in Turlock.